This maintenance outage will take place from Saturday, January 30, 2010, at 10:00PM EST to Sunday, January 31, 2010 at 2:00AM EST. If you use the Google Chrome™ browser, and have tried to access web pages for reserve readings, or other resources in the Library’s secure folder (library.fuqua.duke.edu/internal/), you may have received an UNAUTHORIZED error. Earlier versions of Google Chrome were not compatible with the authentication method we use; but the latest release of Chrome is compatible. Here’s how to get it. Find out if you have the latest version installed (v. 4.0.302.3 as of 1/26/10) by clicking the “wrench” icon in the Chrome toolbar, and select “About Google Chrome”. If you have this version, you don’t need to read any further. If your version of Google Chrome is earlier than 4.0.302.3, un-install Chrome completely using the Add-Remove Programs option in your Windows Control Panel. Browse to http://www.google.com/chrome and download and install the latest beta of Google Chrome. Chrome can also be downloaded from the Filehippo.com file archive where version numbers are clearly visible. With Google Chrome 4.0.302.3 or higher installed, you should now be able authenticate to, and access pages in the Library’s secure folder. If you are running Google Chrome v. 4.0.302.3, and still cannot access pages in the Library’s secure folder, please email us. 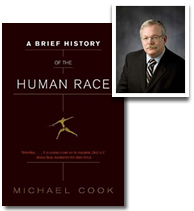 On Tuesday, January 26, 2010, at 7pm EST, Blair Sheppard, Dean of the Fuqua School of Business, and Frank Stasio, NPR Host, will discuss A Brief History of the Human Race by Michael Cook as part of the DukeReads series of webcasts. We encourage you to watch this webcast live on the Duke Ustream channel, or on the Duke Live Ustream Facebook page. 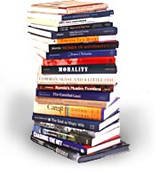 Fuqua School Dean Blair Sheppard asked Ford Library Director, Meg Trauner to select five recent business books that should “be on his nightstand”. 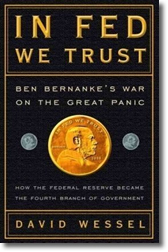 In Fed We Trust: Ben Bernanke’s war on the great panic by David Wessel.An authoritative account of the inner workings of the Fed as they avoid a financial meltdown. Read the full review. The Healing of America: a global quest for better, cheaper and fairer health care by T.R. Reid.Describes health care models in free-market economies that provide health care for everyone at a reasonable cost. Read the full review. The Myth of the Rational Market: a history of risk, reward and delusion on Wall Street by Justin Fox.Focuses on the academic debate on capital markets. How the Mighty Fall: and why some companies never give in by Jim Collins.The author of Good to Great and Built to Last describes the five stages of corporate decline. Read the full review. 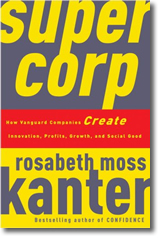 Supercorp: how vanguard companies create innovation, profits, growth and social good by Rosabeth Moss Kanter.A corporate culture that values business performance and social contribution leads to growth and innovation over the long term. Read the full review. The Ford Library will be open for use on the Martin Luther King holiday, Monday, January 18th; but reference and research assistance services will not be available until Tuesday, January 19. Our hours on Monday, January 18th will be 8am – 8pm. 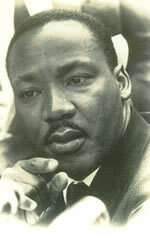 Note that the Fuqua School buildings will be locked on Monday, January 18th for the Martin Luther King Holiday. Library users will need your DukeCard to gain access into the buildings. 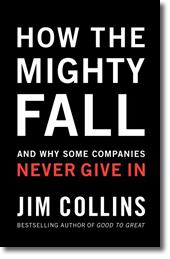 Collins, James C. How the mighty fall : and why some companies never give in. Collins Business, 2009. The author of longtime bestseller Good to Great and co-author of Built to Last, Jim Collins discusses why once-strong companies begin to decline and then die. Using research data from 60 corporations, Collins describes five stages of corporate decline and shows that even the most successful companies are not immune. Interestingly, decline begins long before it become obvious to anyone, even company insiders. Hubris Born of Success. The first stage of decline begins when company leaders lose sight of the underlying factors that created success in the first place. Instead of creatively renewing the core business, they are distracted by other threats and opportunities. Undisciplined Pursuit of More. In the second stage of decline, management loses discipline and makes leaps into other areas that undermine long-term value. The company grows at a rapid rate. Finding talent for key seats in the organization becomes difficult. The company chokes in pursuit of growth and expansion. Denial of Risk and Peril. Internal warning signs begin to mount but management blames the difficulty on external factors or puts a positive spin on the data. Grasping for Salvation. Decline becomes visible to all. Leadership responds by grasping for a visionary leader or a radical transformation. Capitulation to Irrelevance or Death. In the last stage, management abandons hope of building a great future. The good news is that companies can recover. Collins’ research indicates that organizational decline is largely self-inflicted and recovery is possible by returning to solid management disciplines. Eleven companies are profiled, including Circuit City, Hewlett-Packard (HP), Merck, Motorola, Rubbermaid and Zenith, in this interesting and very readable book. Please note that the frost.com web site will be undergoing essential maintenance and upgrade work this weekend, January 9 – 10. The Frost.com web site will be intermittently unavailable from 1AM EST Saturday, Jan. 9, until between approximately 6PM & 9PM EST Sunday evening, Jan. 10. Frost & Sullivan wishes to apologize for any inconvenience this may cause their users.